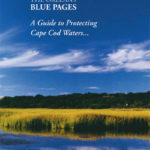 The Orleans Blue Pages were created to help you understand the Cape’s water cycles and to give you practical information on how to do everyday tasks in a way that benefits our waters. Look through these pages to find tips on healthier practices and explanations of why some existing practices are harmful. By taking a few steps, you can make small changes that have a big positive impact. Learn what each of us can do and become an advocate for protecting our environment and our waters! Orleans Pond Coalition extends its thanks to everyone whose contributions helped make this project a reality. We hope that you will find useful suggestions for taking care of our environment and living in harmony with our coastal waters. © 2008 Orleans Pond Coalition. All rights reserved. Reproduction of "The Orleans Blue Pages" in whole or in part prohibited without permission. Orleans Pond Coalition is dedicated to the protection and health of our shared watersheds, estuaries, ponds and lakes.